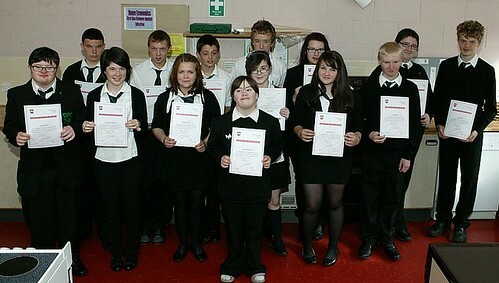 Exam Success – Gairloch High School pupils have again been successful at all levels in their exams. 6 pupils in S6 achieved 10 Advanced Highers in a range of subjects – 7 of these passes at grade A. 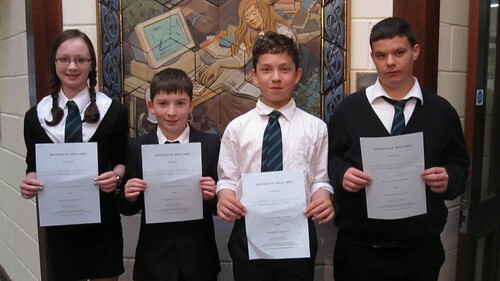 4 pupils achieved 5 Highers – half were A passes. For many other pupils a success at Intermediate or Standard Grade is a success of equivalent proportion. Many of our pupils have achieved grades that reflect their hard work and will provide a path to future study and success. Most of the leavers appear to have achieved results that will allow them to take up courses of their choice at University and College. This is increasingly important at a time when options for leavers are being reduced. In S4 just under half of the pupils achieved their exam passes at the top level in at least 5 of their subjects with two pupils achieving 8 top level grades. As well as these results pupils also achieved passes in a wide range of subjects including Work Experience, Climbing, Employment Skills, Art, English and Music. These unit awards are used to balance and extend the curriculum of pupils. This year S3 pupils also received certificates identifying achievement in English, Art and Music. Subjects where we have noted particular success this year include Art, Chemistry, Gaelic and History at Standard Grade. In the Higher and Intermediate exams Chemistry, French, German, Maths, Gaelic and Music all produced strong overall results. Staff have already discussing results with pupils and each year at this stage we determine how we can improve our success at all levels for our pupils. Pupil Success – Ceitidh Alice Hulme has gained a Distinction in her RAD Ballet Grade 7 exam. Well-done Ceitidh! Duke of Edinburgh’s Award – Iona Proudfoot has received her Bronze Award while Kirsty Alexander and Alasdair Paul both achieved Silver. Several other pupils have also completed and are awaiting certificates. Rotary Youth Leadership – Kirsty Alexander and David Gorman, both S6, attended Youth Leadership Camps, sponsored by Dingwall Rotary Club, during the summer. Both Kirsty and David received very favorable reports from the weeks training course in Nethybridge. Headteacher, Mr. Port has received a letter from the Rotary stating that the two selected candidates proved a credit to the school, themselves and their families, as well as the Rotary Club. Well done! 2011 Schools Bible Project – Each year pupil work is submitted from Religious Education classes in Gairloch High to this project. Four pupils have been rewarded this year for their efforts by Christian Projects, London in this national event. Ceitidh Alice Hulme, John Scott Macleod, Jerome Broome and Ciaran Alexander were each presented with a bible along with a certificate of special merit. Elementary Food Hygiene Certificates Awarded – The new Skills for Work Hospitality class have all worked hard to obtain their certificates. This new course, in conjunction with West Highland College, is looking to build on existing partnerships with local employers and training providers. Hospitality is a well-established industry in Wester Ross and this course fills an identified need to meet the needs of industry and will help Gairloch pupils maximise their potential. Teacher, Mr. Milner, is delighted with the positive start pupils have made and he is keen to make sure the pupils continue to learn through practical experience. Several staff also received Hygiene Certificates. During the summer, Mrs. Johnston, Mrs. Bulmer and Mr. Bowker gained certificates qualifying them as Climbing Wall supervisors. This qualification allows the staff to provide activities to the pupils in addition to their main roles in school. Chez Roux Connection – On the 28th August former pupil Rosie Smith heads off to London to begin her career under the tutelage of Michel Roux Jr. We wish her all the best! Meanwhile Albert Roux has agreed to sponsor the annual Modern Languages prize in Gairloch High. A special trophy and gift book will be organised for next year and beyond. In offering this sponsorship Albert Roux commended teaching staff, Mrs. Campbell, Mrs. Somers and Ms MacAllister for their dedication and success. He also stressed the importance of learning languages chiefly in promoting a successful tourist industry in Scotland. Malawi Update – Dr Caley visited out partner school in Malawi again during the summer holidays. The staff, learners and community of Mlozi School send their greetings to the schools and community here, in particular Mr Chimtali and Ms Ajawa who visited us last year. Mlozi School continues to change and improve. The classroom repair project, funded by our community, has been completed and the old classrooms are looking much smarter. Now that they have doors that lock, teachers are able to put up posters, learners work and other learning resources on the walls in the way that we take for granted here. They have recently received a large number of desks from Unicef, who built the new classrooms last year, so none of the pupils have to sit on the floor now. We will have more about the visit in the next issue. Read the full report here now. Fit for Girls – Studies show that 65% of 14year-old girls do not reach the recommended levels of physical activity and 43% of women do little or no exercise. The Fit for Girls programme seeks to improve on this situation and over the past three years the PE department and the Active Schools Coordinator have been involved in this programme. Grim as the above National figures appear, when the activity levels and attitudes of our S2 female pupils were investigated in session 2008/9 they were found to be significantly better than the average. Despite this relatively high starting point, the follow-up survey in 2010/11 on the same pupils (in 4th year by this time) showed a significant increase in activity levels and even better attitudes towards sports and activity. This is a very gratifying result, especially for Mrs. Hildrey and Mrs. Johnston who have done so much to encourage the girls in their efforts. As a result of the schools involvement in the programme our Active Schools Coordinator, Dr Shearer, has been able to access funds to provide every girl in the school with polo shirts in their house colours: Kerry-blue; Maree-red and Tollaidh-yellow. Our Art teacher, Mrs. Gulliver, has designed attractive logos for each house and these are embroidered on the shirts. There is already a lively inter-house rivalry in the school, clearly shown at the many inter-house competitions and normally reaching a high point at Sports Day. The new shirts will help to foster this house spirit and, hopefully, encourage even more young girls to compete in support of their House. 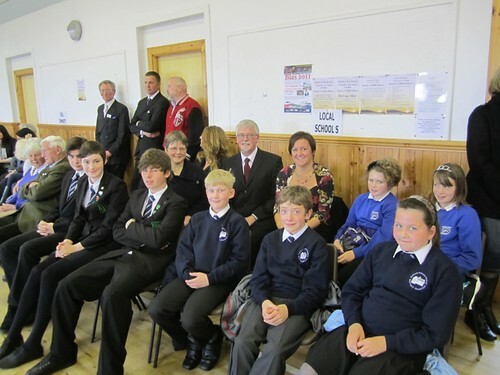 Arctic Convoy 70th Anniversary– Staff and pupil representatives attended the Memorial Service at Cove on August 20th to commemorate the first convoy to leave Loch Ewe 70 years ago. Pupil and staff had the pleasure of being presented to Prince Michael of Kent as well as bearing witness to a presentation from the Russian Ambassador to the Veterans. Details and photographs can be viewed by clicking here.